← house of sand and fog. i’ve developed a morning ritual in the short time i’ve been here. eyes still semi closed, i stumble into the kitchen to sit with my grandmother and her niece where we plan out our day over coffee and sweet cha-ee. my favorite part of this routine is when the toaster pops out a warm slice of noon sangak – a delicious whole wheat sourdough flatbread that i can’t seem to get enough of. there’s a subtle sweetness to the bread that compliments the saltiness of the pannir which i generously coat on top. today i’m feeling a bit creative so i add fresh walnuts for a more earthy taste. and as the family debates the day’s activities, i bite into the warm bread and my eyes drift out the window where i can see the faint outlines of the mountains that surround tehran. even with the smog that interrupts my view, i can tell that’s where i want to be – far away from the intense experiences of tehran, from the nostalgia that surrounds this city. it’s a chilly morning, but the sun is strong. 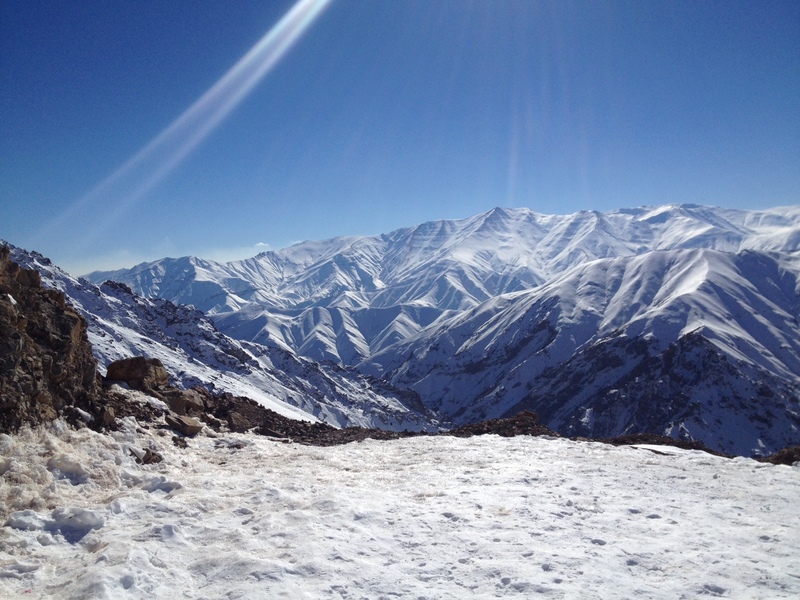 we take off on dizzying roads towards shemshak, a ski resort to the north of tehran in the alborz mountains. my grandmother insists i sit in the front, the view as we drive up will take your breath away, she tells me. but i can’t look ahead, i only stare overhead at the sharp icicles that fall from the cliffs, fearful that even parts of them might break off. they sit firm atop the narrow passageways with no intention of melting or falling. as we drive further north, past small villages and quaint restaurants, i see a charm that doesn’t exist in tehran. tiny shacks and cliffside apartment buildings with big windows adorn the sides of the roads. i feel as if i’ve been transported to a european resort. we arrive only an hour later into the storybook town. 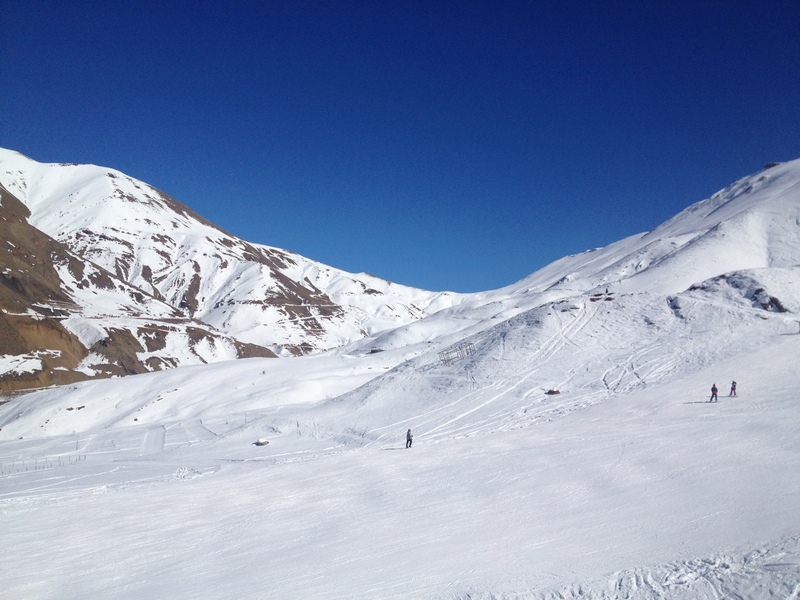 i quickly head towards the ski lift so i can make it to the peak before the slopes close. i don’t know how to ski or snowboard, but the man selling tickets insists that i can take the lift back down. i stand in line and watch as children and couples excitedly ski down, ready to go up for another round. my turn on the lift approaches and i begin to hesitate. i hear the clunky metal seat approach from behind and before i can change my mind, my knees buckle, i fall into the seat and i’m whisked uphill. my hands are bare but i ignore the cold and cling fiercely onto the poles of the chair. i reach for my phone to take a picture, worrying that if i lose my balance, i might fall. but the greed of capturing this view is too tempting to sit safely. i inhale the clean and crisp mountain air, and as the adrenalin inside me begins to settle, my ears are caught off guard by the sound of a party blasting from inside a small cafe below me. 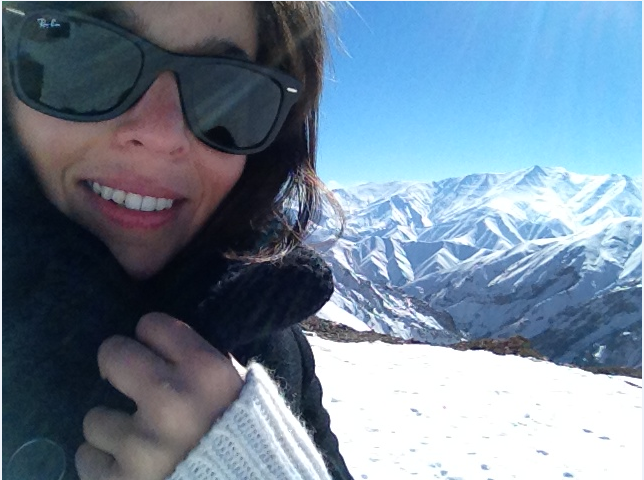 my frozen cheeks attempt a smile as i think of how irrelevant the regime’s rules are to everyone here. i smell a hint of weed from the lift behind me and as i turn to take a look, i see a teenage girl with what appears to be her boyfriend exchange the rolled cigarette. the lift comes to a stop, and a pleasant old man helps me disembark. he giggles as he looks down at my boots and asks me why i’m not carrying any snow gear. he’s disappointed when i tell him i don’t know how to ski and begins to explain that all the youngsters are snowboarding these days. anyway, he tells me, i can walk around and he will help me get back on when i’m done. he laughs again when my rusarri falls off from my head and i nervously readjust it. he points to the bare-headed women around me and tells me not to worry, it’s fine here, he assures me. i take my first steps away from the lift. there’s no hint of pollution, there isn’t any interruption to my view. all i see is a chain of mountains covered in fresh snow. the blue sky behind is so clear, it looks as if it’s painted by farshchian himself. the warmth of the sun takes over the cold wind that gave me chills on the way up. my hands and face begin to defrost and i sit for a moment on the ledge of the mountaintop. there’s a peaceful serenity here – a kind of calm that only nature can offer. a kind of calm i would have never expected to find in a country that is painted as a dark and fearful place. and from this ledge, i can see one thing so clearly: there is so much more to iran than the stories we see from abroad. there is a world to be discovered in this country, a world that newscasters and storytellers forget to mention. a world full of people who are living in vibrant colors. full of youth and energy at all ages, experiencing the slopes of these beautiful mountains, the sands of the caspian sea, and welcoming visitors to do the same. 8 Responses to cold mountain. thanks for passing through, carlos. it was one of the most beautiful trips that i had the privilege of going on and i’m happy you enjoyed sharing part of it with me through this blog. Amazing article Nina, so well written & amusing, well done and look forward for more to read…..
thank you, randa. hope i can keep you as entertained with the future posts! You make me want to go there. thank you loay, i’m glad you’re enjoying the posts.